The big question remains "When will the slide happen?" If viewing on the mobile app, click here. Yakima County declared a disaster Wednesday morning as the threat of a landslide looms from Rattlesnake Ridge, KNDO in Yakima reports. The city of Union Gap also declared a disaster, allowing officials to request the help they'll need when the hillside comes down. The big question remains "When will the slide happen?" State geologists now say they don't expect a landslide event until sometime between late January and early March. "The honest answer is no one knows for certain. There are a number of possibilities. The most likely scenario is that the landslide will continue to slowly move to the south, where the landslide mass will fall into the quarry pit and accumulate. Monitoring data suggests most of the mass will remain in the pit and on the hillside," the Washington state Department of Natural Resources said on its website. Some rocks are expected to fall and reach nearby Thorp Road, but not Interstate 82 or the Yakima River. 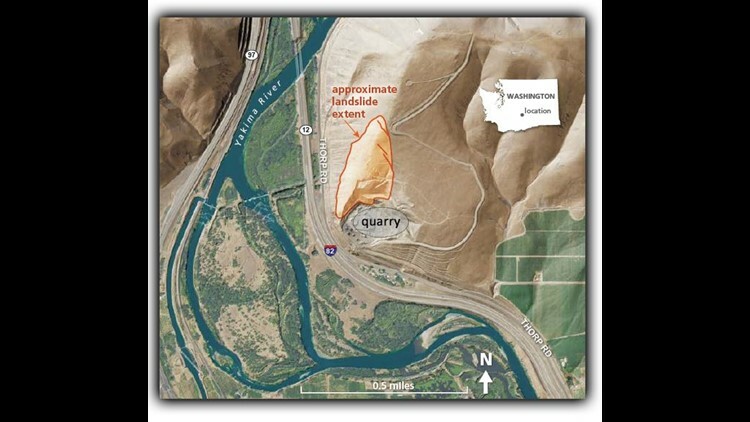 They say "less likely scenarios" are that the landslide moves beyond the quarry and damage houses or run out beyond I-82. 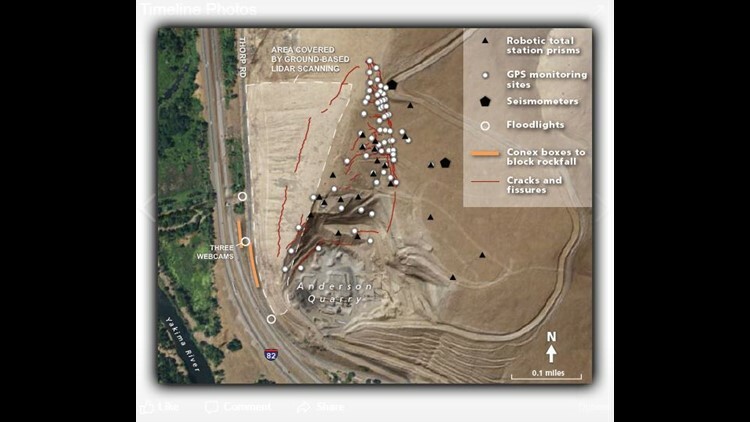 "A landslide that moves west and blocks I-82 and the Yakima River is extremely unlikely." Geologists have been watching the situation since early October when state geologist Dave Norman says a rock quarry company, Columbia Asphalt and Gravel, contacted the DNR to say they’d found a crack in the wall of the quarry, correlating to a growing crack that was threatening to bring down part of a hillside above I-82. Homes in the area have been evacuated and the quarry company is paying to put them up in hotels. Old steel shipping containers full of heavy concrete barricades are protecting the interstate from falling rock, but may not prevent a full-blown slide from reaching the highway. The slide is being monitored by laser to measure movement and by seismometers which are recording cracks and other sounds. Governor Jay Inslee visited the Rattlesnake Ridge area last Sunday to assess the area and meet with local emergency management officials. "The multiple geologists that have reviewed this all have the same conclusion at the moment. And that is, the risk of catastrophic sliding activity that could pose a danger to life is a low risk," said Inslee. "Nonetheless, if that were to happen - even though it's a low risk - the nature of the slide could be very concerning to people, both for residents and for people transiting I-82." Several geologists with multiple state agencies have surveyed the area and provided the preliminary data. Dozens of data collection points have been set up around the slide, providing geologists with data needed to monitor the movement of the land and its risk. Inslee said experts are evaluating whether to have additional monitoring or analysis of the area. "In the next several days, we will be probably engaging a third party, independent consultant that would work for the state of Washington for the multiple agencies involved," said Inslee. "We want to do that to make sure that we have the ultimate degree of confidence in assessing the nature of this risk." Over 50 local, state and federal agencies are working together on the incident, according to Yakima Valley Office of Emergency Management. More people were packing up and evacuating last Friday because of landslide concerns. Tomas Guzman brought his truck to a friend's home, just off Thorp Road. They worked for four hours to pack up the family of three, and get away from the Rattlesnake Ridge area. "We don't want to wait until the last minute," said Guzman. Yakima County Office of Emergency Management has urged about 50 people living near Thorp Road to evacuate, and so far more than 80 percent have left. By now, many in the community have seen the aerial video that shows a long crack in Rattlesnake Ridge. The movement was first noticed in October. Meagan Lott, a WSDOT spokesperson says the land is sliding 1.4 feet each week. Yakima County Office of Emergency Management estimates that 8 million tons of earth could slide within the month. Lott said when it comes to a landslide, "It is not a matter of if but when." She added that there is a best-case scenario. "What we are being told is the material above Thorp Road will most likely go into the pit site below and kind of stabilize itself out," she said. But Lott acknowledged it is possible the landslide could move toward homes and Interstate 82. Freight containers loaded with concrete barriers are set up along Thorp Road. WSDOT says it would not stop a landslide. However, the chain of containers is being used to block falling rocks and debris from I-82. "This morning we had a rock come down and land on to Thorp Road which is the county road that is currently closed right now, and it was the size of a baseball," said Lott. If activity picks up and more rocks start to fall, WSDOT could close I-82. On a typical day, about 30,000 vehicles travel the stretch of Interstate near Thorp Road. If it does have to close, WSDOT says drivers would have a 15-mile detour.